Our Lady of the Mountains Roman Catholic Church, Jackson Wy, originally uploaded by CircadianReflections Photography. This chapel was just behind our Inn in Jackson, WY. 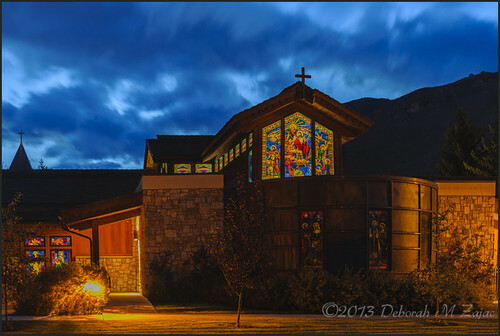 On the last evening I was in Jackson, WY we turned onto the back street to our hotel, and the I saw the church had its lights on, and thought it was so pretty in the twilight that as soon as I got out of the bus I went to photograph it. Next Next post: Sandhill Cranes are Arriving!